.ics Calendar stream for sharing your Calendar. Import .ics streams from other sources. Now you have installed your the plugin and you have activated it. First step is to add a new Page, the title should be Calendar, and the content should be empty. Add this page to your WordPress Menu where you want it accessiable. Move to Settings->Calendar and let's modify the General Settings. Select the Page you created in the Calendar Page drop down box. Select the Day you want your week to start on. I highly recommend you Enable Month, Week, & Day on Available Views. I would enable Posterboard and Agenda as well as I haven't found a reason not to. Set the default view you want to see when you go to the Calendar page. 30 & 5 Events to show for the Posterboard and Agenda are typically fine. Choose the Show location in event titles in calendar views to make it easier to know where the event is, you may find not to do this. 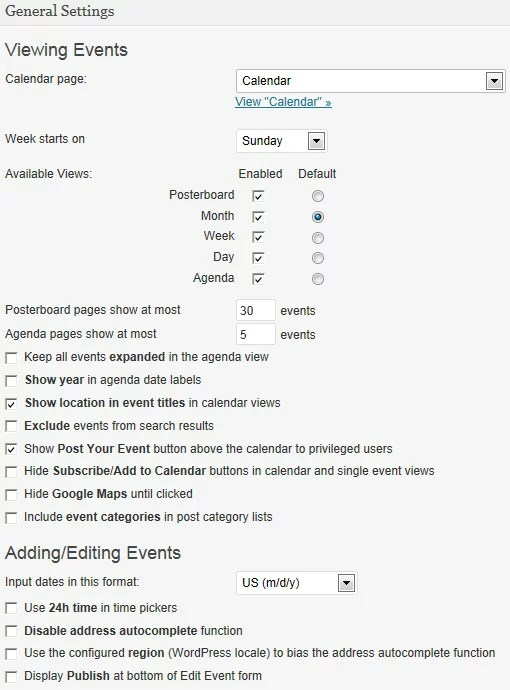 To make it easier for those who add events I select "Show Post Your Event button above the calendar to privileged users"
This is what the top of your Calendar will look like. You add "Categories" for different kinds of Events, so that you can filter what is seen on the page. You can move between years/months easily or jump right to today. Or you can switch views by click on Month and selecting Day/Week/Posterboard/Agenda. Of course you can add new Events by click on Post Your Event. One last thing you have a new widget Upcoming Events you can place in your sidebar to show events that are coming up. Moving from www.wordpress.org Hosted to Self Hosted WordPress Site.